Here at MAX, we recently published an ERP Selection and Implementation Toolkit because we know payoff from invensting in ERP depends on how well the ERP you choose fits your business and how well the system is implemented into your existing operations. When starting to plan for ERP implementation, it can be helpful to use "three loops" model. In keeping with this principle, when implementing ERP you (and your implementation team) will design bill of material structures that match the way products physically flow, and way transactions are completed, and accounted for. You (and your implementation team) will design processes that avoid rework to be done somewhere else (i.e., accounting having to re-class posted entries caused by poorly designed or processed transactions). With this mentality, ERP implementation becomes more than a project; It becomes a practice. Projects are activities with fixed beginning and end dates. Business practices are more lasting. Projects are disruptive and expensive, thus must be carefully selected and managed. Well-defined, agile systems built into business practices reduce operating cost. ERP is initially a project, but then becomes a business practice. So what’s the difference between a successful ERP Implementation and a flop? 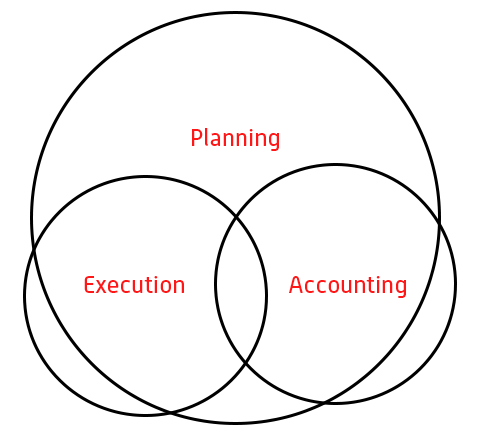 Practices must be built into the project to support all three loops. Not one or two – all three. ERP Implementation is a great time to consider or reconsider that there is one system working for everyone on your team. Always respect the three overlapping circles during implementation.